I want to thank Jeff at Scripture Zealot for passing along the Superior Scribbler Award to yours truly. I suppose every blog award has something of a catch to go with it, but that won't stop me from humbly accepting this one and proudly displaying it in a not-so-humble fashion. 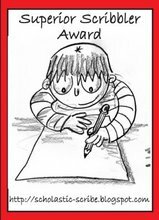 Each Superior Scribbler must, in turn, pass the award on to 5 deserving bloggy friends. Thanks again, Jeff, and to the five of you nominees, my ring is extended for you to kiss.